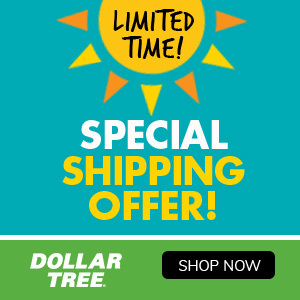 Dollar Tree is offering $4.95 flat rate shipping sitewide now through 4/11! This is a great time to stock up on Easter items, spring items, and more! Offer valid 04/09/19 through 04/11/19. No promotion code required. If you choose to have your order shipped via UPS Ground, the $4.95 flat rate will be applied automatically to your order, however, certain restrictions may apply. Overweight/oversized orders are not eligible for the $4.95 flat-rate promotion; actual shipping rate will be calculated at checkout. Shipments to Alaska, Hawaii, Puerto Rico, or the US Virgin Islands are not eligible for the $4.95 flat-rate promotion; actual shipping will be calculated at checkout.